Player Licences must be verified every 30 days, devices that fail to get a licence will automatically stop downloading new content from the Xibo CMS it is connected to. This module acts as a pass-through to our licensing servers for Players that will not have reliable internet access, or that will run permanently disconnected from the internet. From the Customer Portal navigate to My Products and click on your Licence Pool card. Click on the Add On-Premise button. Once purchased follow the steps detailed below. 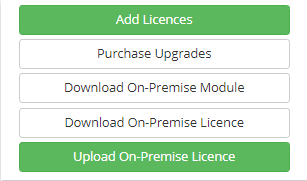 Navigate to My Products from the Customer Portal and click on the Licence Pool card which has the On-Premise Module now enabled. This can be identified with the following icon shown in the right hand corner of the card. Extract just the XiboForAndroidOnPremise.php file from your downloaded module zip file into your shared/cms/custom folder. Be sure to replace licences@example.org with your correct Licence Pool email address. If you already have other middleware enabled, please see the comments at the top of the XiboForAndroidOnPremise.php file which explains how to handle that. Finally, run a manual licence check from the client. It won’t licence the client initially but a file - request.txt should be created on in the shared/cms/library/android folder. Extract just the XiboForAndroidOnPremise.php file from your downloaded module zip file into your /custom folder. Finally, run a manual licence check from the client. It won’t licence the client initially but a file - request.txt should be created on in the /library/android folder. Extract just the .htaccess , android_licence.php and android_config.php files from your downloaded module zip file into your Xibo installation directory on the CMS (to the directory where xmds.php file is). You need to ensure your web server can create a file called request.txt in the server installation directory. We provide a .htaccess file to prevent that file from being accessed from the web server. If you aren’t using Apache then you may need to make alternative provision for that. Once the offline licence files are in place, you need to edit the android_config.php file and set the correct licence pool address for your server. Again that would be the email address you nominated earlier. The other options should all be correct already for you. Finally, run a manual licence check from the client. It won’t licence the client initially but a file - request.txt should be created on the CMS. Extract just the XiboForWebosOnPremise.php file from your downloaded module zip file into your shared/cms/custom folder. If you already have other middleware enabled, please see the comments at the top of the XiboForWebosOnPremise.php file which explains how to handle that. Finally, run a manual licence check from the client. It won’t licence the client initially but a file - request.txt should be created on in the shared/cms/library/webos folder. Extract just the XiboForWebosOnPremise.php file from your downloaded module zip file into your /customfolder. Finally, run a manual licence check from the client. It won’t licence the client initially but a file - request.txt should be created in the /library/webos folder. Download and install the Player application onto your devices and set the appropriate Licence Pool email address in the client settings. Please Note: During this configuration, if the client has access and connects to our licence servers it will automatically licence directly from us, so you need to ensure your Players don’t have any access to the internet unless you are using the “shortcut” method outlined below. To do this, you can simply forget any defined wireless networks in the Player’s wifi device manager, or remove the ethernet cable or mobile SIM card. Please do ensure that the wifi adapter in your device is enabled. 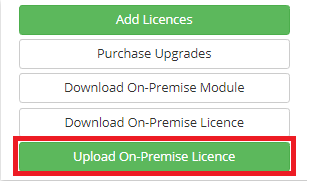 Once you have all the clients you want to licence in the request.txt file, you need to upload that file into the Customer Portal on your Player Licence Pool page. Once uploaded you need to download the android.txt / webos.txt' file by clicking the ‘Download On-Premise Licence’ button. When you have your android.txt / webos.txt file you’ll need to copy it to your CMS. For 1.7 and earlier CMS versions, please place the android.txt file in the Xibo installation directory on the CMS (to the directory where xmds.php file is). For 1.8 / 2.0 CMS versions, please place the android.txt file in the CMS library directory, in the android folder. By default on a Docker install, that would be shared/cms/library/android, and for a custom install, /library/android. Please place the webos.txt file in the CMS library directory, in the webos folder. By default on a Docker install, that would be shared/cms/library/webos, and for a custom install, /library/webos. If you are able to setup Players somewhere where they have internet access before taking them to their final location then follow the Shortcut Method below. This process will initially licence directly with the licence service and then with the CMS after they are physically moved to their final site, without the need for a request.txt file. Licence your device online as normal to get it registered with Customer Portal, then click on your Licence Pool with On-Premise enabled. 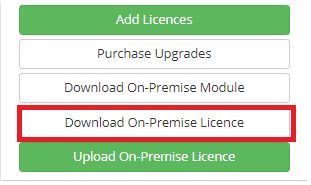 Click on the ‘View’ button and then the ‘On-Premise licensing’ button. Select ‘Licence Download’ to download the android.txt / webos.txt file for you. Then at your destination site (where there’s no internet access), copy your downloaded file. Next, you will need to copy it to your CMS as previously mentioned above.